Eric Gaylord returns to his home town for a respite after a tragic loss, but when his spitfire mother takes on an unknown woman as a business partner, he is forced to face the nightmare he’d left behind or risk losing the one woman who could heal his heart. Forty years after the death of her true love, Judy Gaylord discovers he’s alive. With the guilt of her falling into the arms of his cousin to console her grief, she now must face the man she betrayed. Dr. James Benjamin has dedicated his life to helping people deal with their post-traumatic stress disorder in hopes of forgetting about his own trauma. Not wanting to risk the safety of others, he’s spent decades alone, but when he sees the woman he never forgot from before the war, his heart awakens. Rose Burton yearns to cut a strangling parental leash. After being diagnosed with diabetes, she hashes out a plan to graduate early so she can attend the University of Tennessee with the love of her life, Marcus Vega. Marcus is a young man from the wrong side of the creek. After beating his addiction, he devotes himself to becoming a physician and earning the right to love Rose Burton. But devotion can't erase the past. When he's accused of being involved in a gang shooting, he risks everything to prove his innocence and protect the ones he loves. Sheriff Jimmy Mason, a confirmed bachelor who has spent his life enforcing rules, arrests Trianna Shaw, a free spirited young woman, for breaking and entering. After a night watching over Trianna in the precinct, he quickly discovers she is more than just a criminal, but a woman of passion and intrigue. Trianna will do anything to clear her murdered brother's name. She travels to Creekside to investigate a company involved in her brother's death. But when a hit man threatens the lives of her new friends, she must choose between her promise to her brother and the safety of not only the entire town, but the Sheriff she’s grown to love. Enjoyable collection of HEA's. Stand-alone novella's that are easy to follow. The fact that these stories are grouped together in sequence makes them even more entertaining. Each read has a realistic and different storyline. No graphic violence, sexuality or religious overtones. Believable characters with distinct personalities and real life dialogues. I may re-read this collection and look forward to more works by this author. Every time I read this I feel more connected to the people and town than I did the time before. Sweetwater County is a place like no other. The town is old and holds so many memories of the families and their history. When someone is in need the whole town is right there to make sure it is taken care of. I don't like giving spoilers to a story because I feel it ruins your experience when reading. 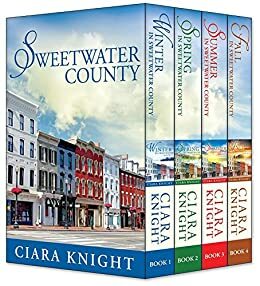 Ciara Knight is so very talented as a writer and author and you shouldn't miss out on any of her books and series. Be ready to find a Sweetwater County of your own to live in. loved all 4 story lines in each book, I am so glad I read them all. I really like the fact that each book was written about people in a small community and there family commitments to each other, even if they weren't related. Can't wait for the next set of books living in the near by city and all the changes in their lives. I thoroughly everything about this series. I fell in love with each character in this book. I literally had to force myself not to read the entire series in one sitting!! I would highly recommend this to all my fellow readers out there. You will definitely not be disappointed choosing to read this series!! This series is a great series to read. I live in East Tennessee and I know the area that the author is referencing in the books. I bought the box set and now I have gone back and bought more in the series.